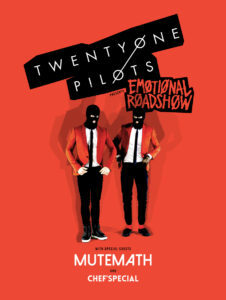 Chef'Special will be joining Twenty Øne Piløts on their ”Emøtiønal Røadshøw” tour. They'll play 47 shows in North America. The tour starts on May 31th in the U.S. Bank Arena in Cincinnati and ends with two sold out shows on 10th and 11th of August at the world-famous Madison Square Garden in New York.